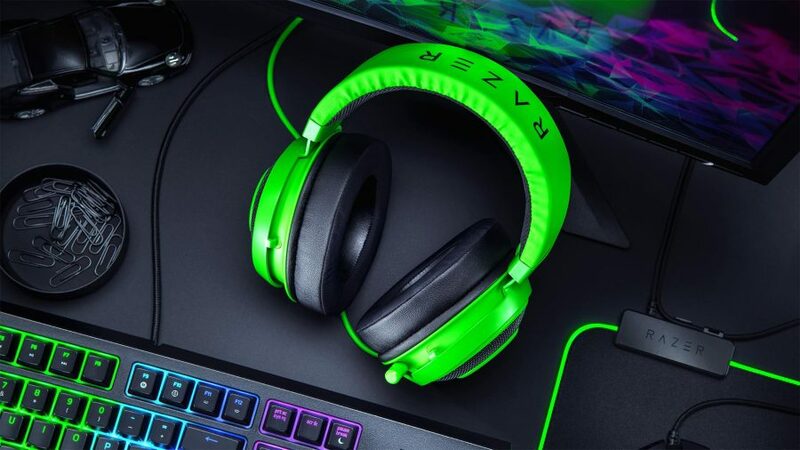 Razer has rolled out three new products targeting price-conscious gamers: the Razer BlackWidow gaming keyboard, Razer Basilisk gaming mouse, and Razer Kraken gaming headset. Since you’ve ended up here, you’re probably shopping around for the latter: a crisp set of cans capable of keeping you ready for anything and alert in-game. But is Razer’s Kraken the one? 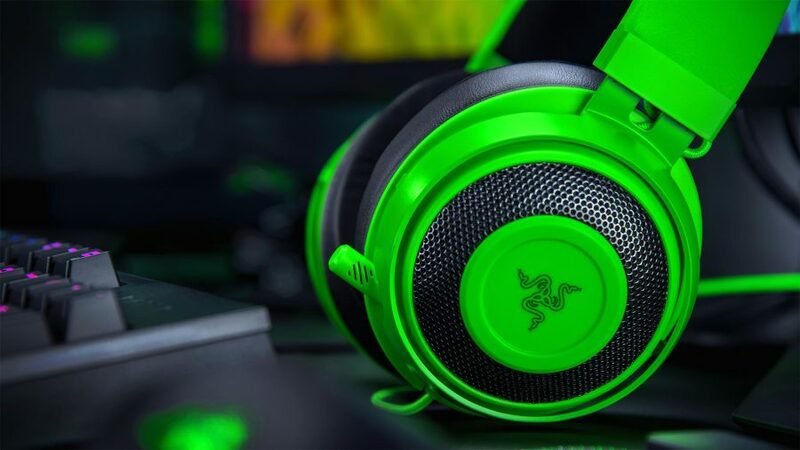 The Razer Kraken is the successor to Razer’s esports headset, the Kraken Pro V2. Little has changed in the aesthetics department with the latest model, rocking the same chunky style as its predecessor. It’s available in bright Razer green, black, PS4 blue trim, or, if you really want to make a splash, sporting a Quartz Pink finish. We recently shipped a box full of Razer Quartz gear to the lucky winner of our most recent giveaway, and I have to admit I was sad to see all that resplendent pink gear go. The Kraken features an aluminium frame, which keeps it exceptionally light on the head. 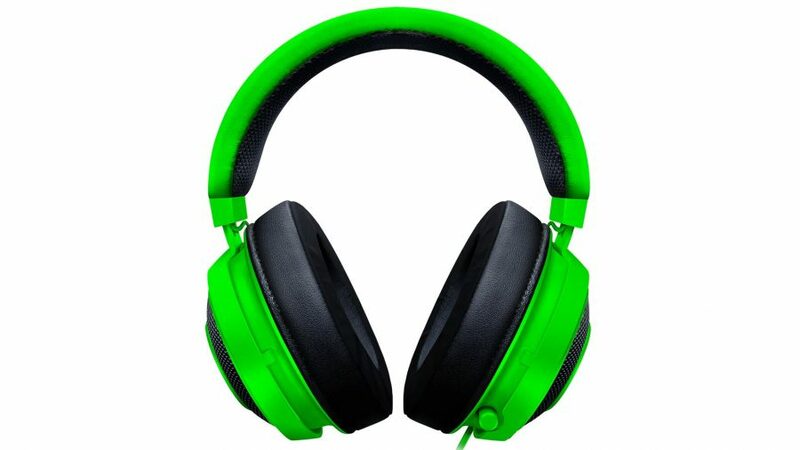 It’s also a durable and flexible material, so you needn’t worry too much about throwing this headset around. I managed to flex the frame entirely flat against my desk without it breaking, after which it sprang right back into shape – no harm done. It’s damn comfy, too. Two of the biggest changes to the formula with the Kraken have been in the name of ergonomics. The headband padding has been upgraded to extra thicc, and the V2’s leatherette ear cushions have been replaced by cooling-gel, memory foam variants with a thermophobic outer fabric. Aside from ergonomics, Razer has seen fit to adopt a new and improved microphone with increased noise rejection. And it’s definitely a move in the right direction. Audio comes across clear and bright with minimal environmental chatter making the cut. Plus, it’s retractable into the headset itself – perfect for forgetful types. Razer has stuck to 50mm drivers with the 3rd gen Kraken headset. Rocking a 12Hz to 28,000Hz frequency range, these drivers excel on paper, but that’s not enough to save the Kraken from some overzealous tweaking. It’s true what they say, frequency range isn’t everything. With a focus on the low-end, clarity in the mids has taken a noticeable hit, and it comes across muddled and busy. And while this balance is often touted as being ‘made for gamers’, the bass still wasn’t visceral enough for my taste. There’s enough impact to compliment a game like Apex Legends, which is in-your-face and loud even on the most muted headsets, yet outside of fast-paced shooters the lack of vibrancy in the treble stunted the auditory experience. And I have to say this left me a little disappointed. In other aspects the Razer Kraken is superb, especially in its overall design, but that lack of depth and clarity across the range simply doesn’t fly in its price range. Coming in at £80, it’s up against the HyperX Cloud Alpha or Roccat Khan Pro – the top two cans on our best gaming headsets list and units that really shine where it counts: audio quality. And, speaking personally, everything else comes secondary to sound quality. A headset can be ugly as heck – many high-end sets are – but can still win my vote over an all-singing, all-dancing unit that offers lacklustre audio chops. And I’m sure most of you feel the same. Well, you should. While the Kraken may succeed in almost every other aspect - comfort, mic, quality - its lack of audio clarity is simply too jarring for me to recommend.